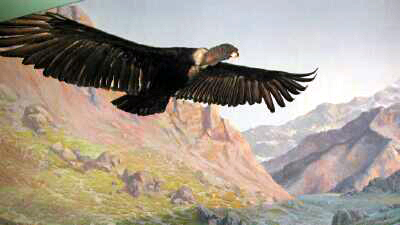 In The Wine Dark Sea, the Doctor is traveling through the cordillera of the Andes and sees several condors (Vultur gryphus, aver. wgt. 33 lbs, wing span up to 10.5 ft.). They are the largest flying bird in South America, and second in size of wing span only to the Royal Albatross and the Wandering Albatross in the world. The albatrosses can reach a wingspan of 11.5 feet, while the condors have a maximum of 10.5 feet. The doctor could tell easily that they are scavengers: the head bared for feeding inside of rotting carcasses without fouling its feathers; the strong hooked beak for tearing through thick hides; the gliding flight used to locate carrion. In addition condors (and vultures) have no sense of smell. This is certainly convenient if much of your diet is rotting meat, but it does make it harder to locate dead animals. Here Condors use their size to their advantage. They keep their eyes open for turkey vultures, the smaller scavenger of the Americas that do have a sense of smell. If the condors spot turkey vultures circling down they will follow them and when they arrive at the carcass, they will force the vultures to wait while the larger condors feed first. This is sometimes to the advantage of the vultures as well. If the carcass is a large one, the smaller vulture could not tear through the hide on its own, and will get more to eat even after the condor has broached the body and eaten its fill. The condor's size also allows them to intimidate smaller predators and steal their kills, as the Doctor himself observed. Condors also take the eggs and hatchlings of other birds, which can be easy prey. Now we come to one of the great "what ifs" in literature and science. The guide showed the Doctor a condor's nesting site on the top of a cliff. The Doctor wanted to climb up and examine the nest, but the guide refused. It was too late in the day and it would be unsafe to try and climb down in the dark. Twenty-five years later, in the 1830's, another amateur naturalist was traveling through the Andes. 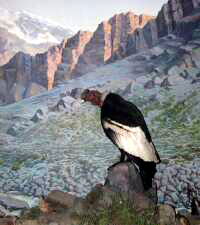 He was also unable to look into a Condor's nest first hand and chose to use the information from his guide that condors lay two eggs each year. If Dr. Maturin had been able to observe and report to the Royal Society, he would have correctly recorded that condors lay one egg every two years, and Charles Darwin would have been spared one of his few published errors. Doctor Maturin also got to see some impressive birds closer to home.